Pete Barker scored the biggest individual win of his career on the PSA tour this week, by defeating David Palmer 15/13, 11/9, 11/2 in the final of the inaugural Sweet Home Chicago Open. "It's the best tournament I've ever played. I love playing in America!" Barker commented after lifting the trophy. On the back of his win the left-hander from Essex will be looking to quickly reclaim a berth in the World top 10 rankings (he curently resides at 12), and his victory bodes well for the upcoming World Open in Manchester. 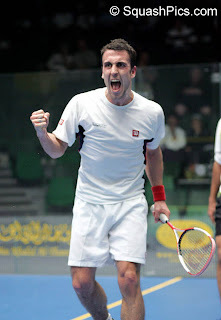 The Chicago event featured a host of community squash events and exhibitions, including an appearance by Jonathan Power. As I commented earlier in the year when discussing the Davenport squash tournament, professional squash in the US appears to be attracting a lot of attention, both from sponsors and the media, though my optimism was tempered earlier in the month when I saw that the US Open was to be postponed due of lack of sponsorship. Left: Video footage of the final, provided by PSAlive.TV.